As a new visitor or old, look here first for some organizational hints and list of new material added. This is a 4 generation report from my Reunion 9.0 software. It includes my working note sections. ) Needs to be updated. Documents relating to this couple and their ancestors. Documents relating to the children of this couple in Germany and America. Grave card from Fairmount Cemetery in Newark. Hanna Squire Ecker, her son Louis and his wife Caroline Elizabeth Reiker Ecker are interred. Page from the church books of Unterreichenbach where our Eckers came from. We can trace our family back directly to Hans Georg Ecker and his wife Anna Barbara, the first Eckers in the village. Hans Georg was born in 1694 and died in 1758. The couple were married in 1719. They are my 7G Grandparents. Better yet, we now know the name of their parents and the next village back: Hallwangen. Stay tuned. I clipped these from Pension Documents. It is interesting to see the spellings, indeed the occasional variations with time and illness. A selection of maps of Württemberg containing areas of interest. Photo interited by my mother. I believe the woman labeled Edith is my grandmother but I do not recognize anyone else. San Souci is an amusement park in PA. The labeled woman is my Great grandmother Edith Beaver Ecker, the mother of Edith in Group I. I do not recognize anyone else but wonder if the man to her left might not be Charles Edward Ecker. Are some of the other people also in Group 1? What is the connection to Pennsylvania? I have known of this photo for the past 5 years. I found it in my mothers things after her death. Some identifications were written on the back, but was not possible to name everyone, define the all relationships, or date it accurately. 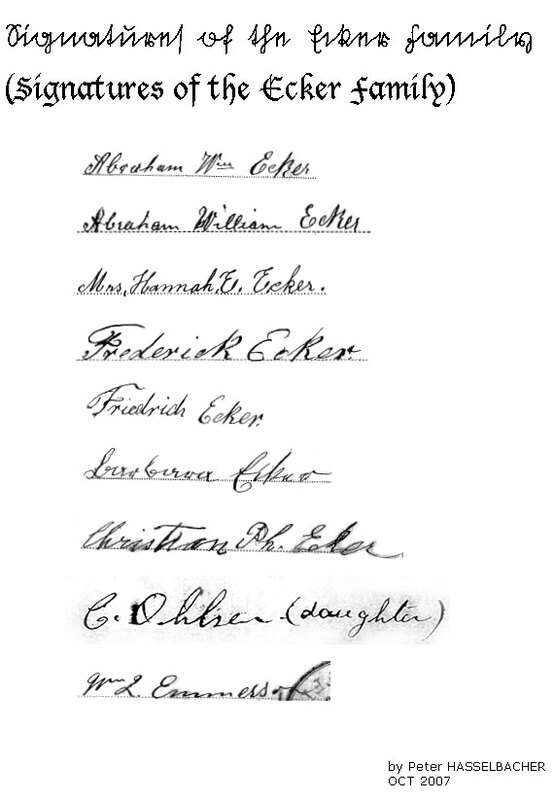 I was able to find and correspond with the grandchildren of Caroline Ecker and her husband Henry Ohlsen. They also had a copy of this photo, but with a different set of identifications written on the back by their Aunt Gussie (Agusta Ohlsen), the daughter of Henry and Caroline and granddaughter of Hanna Squire Ecker. This is what I had hoped would happen! I now believe I can identify everyone in the photo. Caroline (Carrie) Riker Ecker is the wife of Lewis Harris Ecker. Edith Ecker (My great-grandmother) is described as the wife of Uncle Eddie, and the mother of Edie (my grandmother). Arthur Ecker is said to be 15 yo which dates the picture at 1905. Hanna would have been 44 when she had him. Her husband (whose name I subsequently found to be Abraham Wilhelm (William) Ecker) died in 1892. He fought in the Civil War and has an interesting story to tell. In 1910, my Great-great-grand-mother Hanna was a widow with 7 of 14 children living. In the 1900 census, a daughter Minnie was listed, but not a Julia. In the 1910 census, Minnie was not living with her mother. For a while, I thought that Julia in this photo and Minnie may have been the same person. That is not the case. When I learned Abraham's real name, I was able to find the 1880 census in which both Julia and Minnie are listed, along with a son named Henry. William and Hannah also had a son in1871, in Albany NY named Frederick Christian who appears not to have survived. I found a 1900 census report of a William and Julia Emerson living in Newark. Julia's father was born in Germany, and she was born in New York. If these are the same people in the photo above, then the order of William and Hannah's known named children would be: (In New York) Henry 1867, Julia 1870, Frederick Christian 1871, (in New Jersey) Charles Edward 1873, Lewis Harris 1875, Minnie L. 1876, Caroline C. 1880, Alfred 1883, Mary M. 1885, and Arthur Harrison 1890. Of these, I suspect that Henry, Frederick, and Minnie did not survive to the time of this photo. That Julia would be the oldest surviving child is compatible with the apparent ages in the photo above. I am hopeful that there are still relatives out there who will be able to help us. This is a wonderful and unique portrait. Help me show it to as many Eckers as possible.